The Royal Geelong Yacht Club received a number of accolades at the Victorian Sailing Awards held Friday 1 June, 2018, with Michael Parks being named Victorian Junior Sailor of the Year and the Club receiving the Media & Publicity Award. Four other RGYC sailors were recognised at the awards night, with Michael and Steven Case taking first place in the Victorian Sailing Cup (29er class) and Elliot Hughes and William Farnell also finishing in 1st place in the Victorian Sailing Cup (International Cadet class). Victorian Junior Sailor of the year, Michael Parks, also picked up a first place in the Victorian Sailing Cup in the Laser 4.7 class. 16-year-old Michael already has an impressive sailing resume, becoming a world champion at the age of 14 with the ISAF World Team Racing Championship. Michael will again compete on the world stage this coming July in the Laser 4.7 class in Gydnia, Poland. Michael, a member of the Barwon Sports Academy, was also selected to the 2018 Victorian Sailing Team in the Laser class, which was announced at last Friday’s award ceremony. Michael has been nominated for Victorian Junior Sailor of the year for the past three years and this is his first win in this category. The Royal Geelong Yacht Club was successful in winning the Media & Publicity Award for 2017/18, for its extensive coverage of the Festival of Sails, Wooden Boat Festival and RGYC sailing programs. The Festival of Sails celebrated 175 years in January, while the Wooden Boat Festival enjoyed significantly increased crowds over the March Labour Day long weekend. The Royal Geelong Yacht Club was visited by Prime Minister Malcolm Turnbull in January, increasing the profile of the club and its fundamental role in revitalising the waterfront. 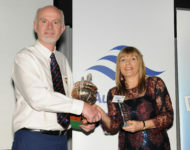 Royal Geelong Yacht Club Commodore John Kint was delighted to accept the award on Friday night on behalf of the Club. “I am thrilled that RGYC has received this recognition. After winning Victorian Yacht Club of the Year and Discover Sailing Centre of the Year at last year’s awards, it is wonderful to see that our Club continues to excel. “We are fortunate to partner with some fantastic local Geelong businesses who assist us with our public relations, digital media strategy and promotion, and I would like to thank Passionfolk and McCo Group for their work and creative ideas that have contributed to RGYC winning this Media & Publicity Award,” said Mr Kint.